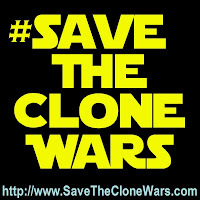 A few days ago, LucasFilm Animation announced the end of the Star Wars: The Clone Wars as a TV show on StarWars.com. Their announcement stated that " Lucasfilm has decided to pursue a new direction in animated programming," that "we feel the time has come to wind down the series," and that "fans can soon find this bonus content." Bonus content makes it sound that the new content will be released on StarWars.com instead of being a season of the show or direct to DVD/Blu-Ray movies. We appreciate Disney and LucasFilm and are looking forward to the sequel trilogy; however, we love The Clone Wars! We want more than bonus content! We want the many stories that the creators have set out to tell to be completed. We ask that the powers that be to please reconsider this decision. We have embedded the YouTube video below that was posted along with the announcement. Check out the recent RebelForce Radio episode, "RebelForce Radio: Special Report - Save The Clone Wars" released on March 11th in which Jimmy Mac and Jason Swank are encouraging fans to write letters to Disney and LucasFilm.